After breeding Samura to Ali Saroukh and getting three colts, two bays and a grey we finally had this amazing filly that we named in honor of her grand dam. Bint Bint Sayo, shortened from Glorietasayonaara. At the farm we call her BB Sayo and she is a wonderful reminder of her dam and grand dam in so many ways. She continues the pattern of being incredibly hot, very spirited when free or being presented, yet gentle with humans. These are powerful moving horses and you can easily see in the photos that they carry themselves very regally with heads in the air. BB Sayo has become an extraordinary broodmare; producing fantastic females and males. 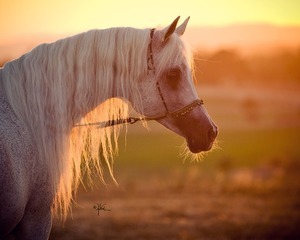 Her first filly, Shahla SMF was sired by Ansata Nile Pharaoh (Ansata Iemhotep x Ansata Misty Nile by Ansata Hejazi) and sold to Sheikh Khalid Al Gatani, owner of Salayel Arabians of Al Khobar Province, Kingdom of Saudi Arabia. We have sold very few females from this family, mainly because we have not had many! She gave us a colt in 2010 by Makhnificent KA, essentially an outcross to her pedigree except they are related thorugh Ruminja Bahjat, a full brother to Ruminjaj Ali . 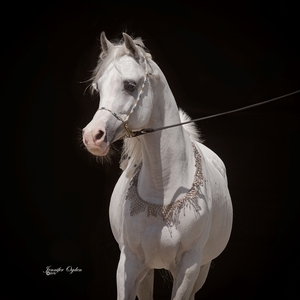 His name is Sayo Sahran SMF, a beautiful bay that will began his breeding career this year, in 2014. In 2012 she gave us another filly, this time by Symbolic SMF (Majestic Noble SMF x Shaboura by Ali Saroukh) . This filly we named Sheikha Sara SMF. She is intensely linebred with the only outcross bloodlines those of Majestic Noble SMF through his sire Marquis 1, again bringing in the Sameh sire line. We hope she will give us more fillies!! In 2014 she gave us an incredible colt that we named Sheikh Sami SMF by Majestic Noble SMF, we are crazy about this colt. She is in foal to Symbolic SMF again for 2015, not because we did not love the Noble colt but because the mare will not get in foal two times in a row to the same stallion! 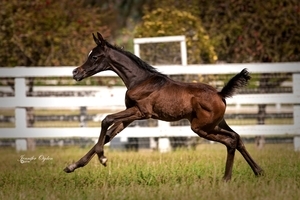 Sheikh Sayeed SMF was born in March of 2015, another stellar foal out of this mare. A b it different than his maternal brother Sheikh Sami SMF but equally grogeous.